Although the amount of excess carbon that human beings are introducing into the atmosphere will undoubtedly lead to the catastrophic side effects of global climate change in the near future, period costume dramas are the worst thing happening to the world right now. Despite their exploration of the same sterile, usually white, usually wealthy, usually British societies time and time again, this zombie genre refuses to stop rapping at the door of Oscar season. The trailers for Mr. Turner, another period costume drama, inappropriately advertised the film as a pleasant matinee affair for the Downton Abbey crowd. Fortunately, even while clocking in at a wholly unnecessary 150 minutes, Mr. Turner is so much more interesting than that. Written and directed by Mike Leigh (of Happy-Go-Lucky and Secrets & Lies fame), Mr. Turner follows the life of English painter J.M.W. Turner in the mid-19th century. The narrative is loose but deliberately paced, just slightly perpetuated by the greying of Turner’s hair and the evolution of his artistic voice. 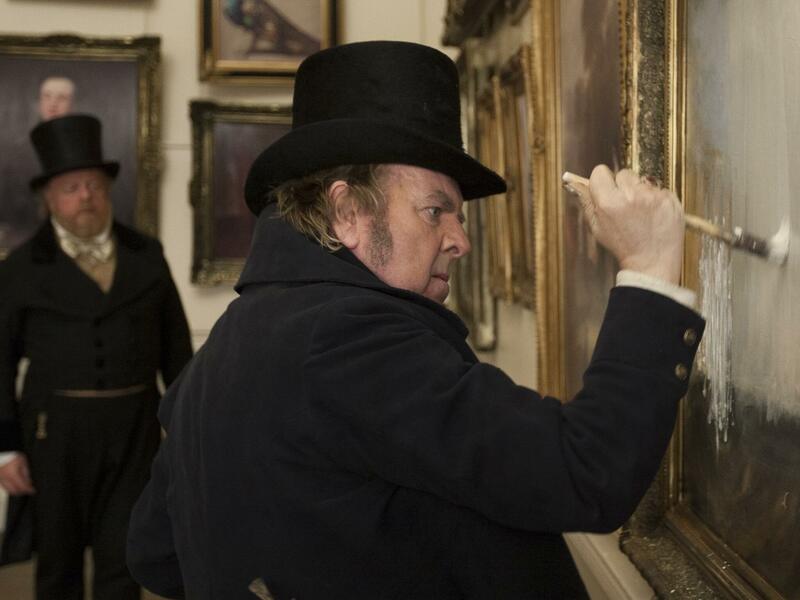 Played by Timothy Spall, Turner is a rare character that reminds you just how underwritten many film characters are. By the end, Turner has been developed as well as any protagonist of a good television show in its third or fourth season. It is impressive to see Spall portray Turner so eloquently in a film set on this large of a scale, especially when the downright creepy aspects of Turner come to light. Although Mr. Turner is Spall’s vehicle, each supporting actor keeps up with him and brings a lifetime to the screen. The film’s most affecting moment comes when Turner encounters an old traveller, played by Karl Johnson, who recounts to Turner his horrific memories of a slaver port. We’ve only just met the character, but Johnson incredibly portrays decades of spectator’s guilt with just a handful of lines. Despite the talent of Spall and his supporting cast, the entire ensemble is overshadowed by Mr. Turner’s truly stunning art direction. The film’s cinematography, production design, costumes and music are nominated for Academy awards and they are all sort of magnificent to behold—particularly the costumes by Jacqueline Durran, one of the best in the business. Part of my beef with period costume dramas is that the costumes are such a huge focus of the films and yet they always seem stagey, either too clean or too grungy. The costumes in Mr. Turner feel like real, actual clothes; they’re lived in, functional and have weight. The musical score by Gary Yershon is also a pleasant surprise, sounding unusually sinister for the pastoral images it often enhances. The flaws of Mr. Turner don’t amount to much. It ends about two scenes too late, there’s a subplot about a failing artist that doesn’t go anywhere and the film runs out of steam toward the end of its gratuitous 150 minute runtime. However, who can complain much about a film this good being overlong, considering it may be a once in a lifetime opportunity: a period costume drama that manages to actually enrapture and actually impress with its costumes.